Overall, the G2 edition of Tamron’s wide zoom is a worthwhile upgrade over the original, and its optical stabilization is useful for low-light handheld shooting. However, Sigma’s 14-24mm f/2.8 Art lens has the edge for image quality. 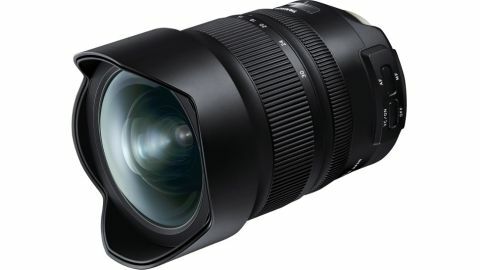 Reinforcing its reputation as a manufacturer of high-quality lenses that can rival own-brand optics, Tamron launched its 15-30mm wide-angle zoom four years ago. More recently, we’ve seen some highly impressive ‘G2’ (second-generation) lenses that ramp up build quality, handling and performance. These include the pro-grade 24-70mm f/2.8 and 70-200mm f/2.8 zooms. Now it’s the turn of the 15-30mm lens to get a G2 makeover. The original Tamron 15-30mm lens grabbed the headlines with its combination of a fast and constant f/2.8 aperture rating, along with a built-in optical stabilizer. The latter was courtesy of Tamron’s proprietary and highly effective VC (Vibration Compensation) system. The G2 lens sticks to the same formula, but the new edition has an uprated 4.5-stop stabilizer, which is no mean feat for such a wide-angle lens. That said, the Tamron doesn’t go quite as wide as the recently launched Sigma 14-24mm Art lens, and the maximum viewing angle is much narrower than from the Sigma 12-24mm Art lens, both of which are stellar performers. The optical path is essentially the same as in the original lens, based on 18 elements in 13 groups. These include XGM (eXpanded Glass Moulded Aspherical) elements and several LD (Low Dispersion) elements, aiming to keep distortions and lateral chromatic aberrations to a minimum. However, whereas the original lens had two types of conventional and nano-structure coatings to reduce ghosting and flare, the G2 lens adds a third ‘AX’ (Anti-Reflection eXpand) coating. The main advantage of this newly developed coating is that it can be applied to the heavily curved surfaces of convex elements. Build quality is good in every respect, with a solid and highly robust feel to the lens, along with a comprehensive set of weather-seals. The original had a moisture- and grease-repellent fluorine coating on the front element but, in the G2, it’s reformulated for greater durability and better performance. At the rear of the lens, a gelatin filter holder is fitted to the Canon-mount edition but this is absent in Nikon-mount version. Using the widest viewing angle, sharpness is very good across the whole image frame at apertures between f/5.6 and f/16, with minimal vignetting. To retain similar levels of sharpness from the centre to the corners of the frame at 30mm, you need to stop down to f/8. The G2 lens is better able to track moving objects in action photography, thanks to a revamped autofocus system that delivers faster performance and greater precision. In this respect, it’s very similar to the two Sigma lenses that we mentioned earlier. Image quality is mostly similar to that of the original lens. Sharpness is impressive at the centre of the frame but comparatively lacklustre towards the edges and corners, unless you stop down to f/5.6 though most of the zoom range, and f/8 at the long end. Those are the findings of our lab tests but, in real-world testing, we often found the Tamron to be quite soft across the whole frame when shooting wide-open at f/2.8. The Sigma 14-24mm f/2.8 lens is superior in this respect. Barrel distortion can be quite noticeable at 15mm, and there’s a little pincushion at 30mm, but very little distortion in the central region of the zoom range. Colour fringing is quite minimal and the Tamron steals a narrow lead over Sigma lenses for suppression of ghosting and flare, helped by its new high-tech coating. Sharpness is measured at the centre and edge of the frame and across the aperture range. The different lines on the graph show sharpness at different focal lengths across the focal length range of the 15-30mm. Sharpness is impressive at the centre of this lens, but is more pedestrian at the edge of the frame. Distortion scores at the 15mm and 30mm ends of the zoom range. Scores closest to zero are better. Barrel distortion is marked at the 15mm end of the lens in our tests.